Microsoft Dynamics, a division of Microsoft, offers a wide range of integrated, end-to-end business applications and services designed to help small, mid-market and corporate businesses become more connected with customers, employees, partners and suppliers. Microsoft Dynamics' applications optimize strategic business processes across financial management, analytics, human resources management, project management, customer relationship management, field service management, supply chain management, e-commerce, manufacturing, and retail management. Microsoft Dynamics includes a range of widely adopted software solutions, including Microsoft Dynamics AX, Microsoft Dynamics CRM, Microsoft Dynamics GP, Microsoft Dynamics NAV, and Microsoft Dynamics SL. These applications are designed to provide insight to help customers achieve business success. Inteq provides solutions and services to the largest organizations globally. Inteq has pioneered and perfected the Global Delivery Model – it employs a rigorous software development process which incorporates stringent quality standards, takes a disciplined approach to distributing IT development work, and leverages a talented and trained workforce. Our primary emphasis is on setting up and operating offshore development centers for our customers. We also provide a range of consulting services which include: Business Consulting, Business Process Analysis and Staffing for existing projects. Strong people base required to deliver and sustain ERP projects. The Microsoft Dynamics Practice at Inteq has a large pool of Microsoft Certified Business Management Functional and Technical Solutions Specialists. Inteq has access to an exhaustive pool of talented consultants adept to the local requirements in Europe, Middle East and US markets for an added advantage to our clients to meet all their short-term/long-term project/staffing needs. Inteq provides a full life cycle support that starts right from the requirements gathering phase including business process re-engineering and progresses to the analysis of the requirements, technology and architecture determination, design, project planning, implementation, testing, deployment, post deployment support and finally maintenance . Inteq proven track record leverage on our experience in providing technology solutions to Client’s across the globe in multiple domains. Our delivery model is supported by best practices that give complete visibility to our customers. It judiciously balances the offshore and onsite components for the various phases of the project to deliver cost effective solutions. Inteq uses a number of project management tools to keep track of project as well as relationship health. Extensive usage of tools in all phases of the Project Management process is a key feature of Inteq methodology, which provides better review and control and also makes it smarter and faster. Delivering high-quality care may be the number one priority for healthcare providers, but finding ways to reduce costs has become the number one imperative. The key lies in finding ways to streamline processes, eliminate inefficiency, increase productivity, and improve decision-making. Expanding the use of information technology (IT) is a smart way to reduce costs and improve access to patient and organizational information. A powerful computing infrastructure helps makes it easier to share the patient information necessary for clinical decisions and access the financial data required to drive business decisions. Equally important, today’s technologies enable physicians, nurses, and administrators to work together as a single integrated team. Microsoft Dynamics solutions are helping healthcare organizations around the globe improve financial and business processes and deliver more cost-effective healthcare. Manage financial processes, drill down into summary information, and track non-financial statistical data with ease. Shorten the budget cycle and generate accurate financial forecasts by using powerful budgeting and forecasting tools. Track and analyze vendor information, efficiently process payables, and make the most of vendor discounts while maximizing cash flow. You can also simplify human resources tasks with tools that are designed to give you greater control and security in managing sensitive payroll information and reducing administrative costs. Attract and retain talented employees by tracking applicant and employee data. The Microsoft Collaborative Health initiative is helping healthcare organizations address industry challenges by using new technology as a powerful catalyst both to reduce costs and inefficiencies and improve the quality and affordability of healthcare. Built on familiar technology, collaborative health solutions are replacing manual, paper-based transactions with automated processes that streamline information entry and help provide you with seamless access to information from any location. Manage materials and comply with regulations. Manage an entire supply chain with distributed requisitions management and approval, control over purchasing and vendor management, and comprehensive inventory tracking and control. Ensure that supplies are on hand by using tools for expiration dates, serial and lot management, and multi-bin and multi-location items. Address regulatory compliance initiatives with a framework for storing, categorizing, and searching compliance documents, tracking document modifications, and ensuring that managers have the necessary data and materials to maintain compliance. Together with solutions from industry partners, Microsoft Dynamics addresses a broad range of regulatory requirements and helps provide the tools for implementing intelligent Health Level Seven (HL7) messaging for international standards. Manufacturing is still a major engine in today’s economy. The fundamental success factors in this industry remain constant: produce the right products—in the right quantities, at the right time, with good quality, and at a price the customer is willing to pay. However, flexibility and continuous improvements are also imperative. Success includes the flexibility to respond to emerging markets, such as today’s growth opportunities in China and Eastern Europe, and to the ever-changing needs of the customers. Capitalizing on these opportunities and demands involves quickly adapting to new approaches, trading partners, and procurement strategies. Microsoft Dynamics offers integrated, adaptable business applications for small and medium-sized organizations and divisions of large enterprises. These integrated solutions—delivered through a worldwide network of experienced Microsoft Certified Partners—work like and with familiar Microsoft software and help automate and improve financial, customer relationship, and supply chain management. Synchronize communication between engineering, manufacturing, and subcontractors. For example, if engineering makes design changes, operations can know the details immediately. To ensure the increased agility in engineering is supported by your subcontractors, your communication solution needs to integrate with your enterprise resource planning (ERP) system. Product data management and integration between computer-aided design (CAD) and Microsoft Dynamics solutions have helped customers improve product design. Engineers can get an overview of reported errors in drawings, and manufacturing can confirm the latest design is being produced. Business portals let you share information within your systems through the Web to the right people at the right time to keep your business moving forward and your customers happy. Landing a contract or making the sale isn't enough. You need to provide outstanding after-sales service to ensure customer loyalty. With Microsoft Dynamics solutions, you can track a project from design through "as-built" configuration. The bottom line: Your service personnel will be able to deliver the right parts—a critical first step towards effective preventive maintenance. Microsoft Dynamics solutions gives you access to deep customer knowledge based on past experiences, helping you identify and meet or exceed your service-level agreements (SLAs) and contract requirements. Provide accurate estimating and quoting. You can efficiently align customer requirements with your capabilities by maintaining a standardized product line and using your previous experience with a customer to suggest the most effective equipment. Microsoft Dynamics solutions can help you plan for standard components, thereby reducing lead time. In many cases the subsequent discovery of omissions or mistakes poses the biggest challenge; Microsoft Dynamics solutions can help you record customer requirements accurately and reuse the information in future quotes. Production planners often struggle with keeping each job separate and visible in order to match specific customer requirements with resources. When production-runs encounter problems, planning or engineering needs to change the process. But in many cases, these changes are lost in aggregate production activities and data. To help you respond effectively, Microsoft Dynamics solutions support manufacturing modes such as engineer-to-order, make-to-order, make-to-stock, or mixed/hybrid modes. You decide and define your best practices and how you want the planning system to execute. Additionally, wireless technology can help increase the capability and flexibility of your plant and workers. Good project management accounts for resources such as materials, capacity, engineers, service personnel, critical paths, and slack time, helping you deliver on time. It also helps you identify the completion state of tasks and provides an overview status of the project. With Microsoft Dynamics solutions, you can set budgets, manage billing, review current costs, and track activities and resources related to a project at many levels of detail. You can also leverage knowledge and content from existing or prior projects to improve your processes and avoid mistakes. In professional service organizations, efficiency is a primary concern. Businesses are challenged with selling an intangible product that is ever-changing and difficult to quantify. Profitability requires that projects are estimated correctly, are completed on time, and meet customer requirements. To succeed, professional service companies must adopt strategic and comprehensive financial, project, and resource management practices. Expanding the use of information technology (IT) is the best way to add greater value while supporting more cost-effective operations. Bottom line, an affordable computing infrastructure can help your company and your people share data, work together, and make effective decisions more easily. Microsoft Dynamics offers a set of strong solutions to help professional service organizations manage every aspect of their company, from customer relationships and projects to business process outsourcing and financials. These solutions can help you streamline operations while increasing value, improve interactions with customers, and make faster, smarter decisions. Keep the customer front and center. Microsoft Dynamics solutions can help you manage and track all customer-facing activities from the initial point of contact. A guided sales process provides automated routing, notifications, approvals, and escalations. A flexible IT infrastructure facilitates customer interactions with electronic document capabilities and protects deliverables with version control for approval workflows, document-profiling, and publishing. Web-based access and robust security features promote safe interactions while protecting business-critical data. Project management and Microsoft Dynamics solutions help you deliver detailed, multidimensional project information for more complete initial project estimates and future quotes. Improve visibility for key decision-makers by configuring workflow-driven approval processes, critical path schedules, and exception-driven alerts. Use IT resources for accurate critical path-scheduling and effective allocation of internal resources. From Web-based time and expense entry systems to automated billing and customized invoicing, business tools can help make operations healthy and profitable. By monitoring daily and monthly metrics, you can make incremental, company-wide improvements such as boosting productivity, rewarding employees through automatic incentive systems, and modifying salary structures to reflect the current market. Automated payment systems protect cash flow, track outstanding liabilities, and make payments contingent on deliverables. There is no time for rest in distribution. As globalization trends continue, new channels are constantly developing. And existing channels are expanding with new approaches—such as global sourcing, cross-sell capabilities, third-party logistics, and radio frequency identification (RFID) solutions. Companies are shifting to more advanced distribution management processes as increasing competition and disintermediation concerns grow. These trends are driving changes in distributors’ business relationships and processes. Customer service expectations are also expanding. Major customers and vendors are requiring specific service-level agreements and compliant technology business processes. Microsoft Dynamics offers a powerful technology platform that gives distributors the critical resources they need to manage every aspect of their business, from order entry and procurement to sophisticated inventory and shipment management. Integrated applications can be deployed quickly and inexpensively without complicated customization or drawn-out implementation projects. For small and mid-sized distributors, information technology (IT) is the most effective way to add greater value while supporting more cost-effective operations. Automating business processes at each touch point—from order capture to inventory replenishment—helps streamline diverse tasks and simplify business intelligence-gathering. With an integrated distribution process, your company can better manage information and materials while controlling costs and performance. 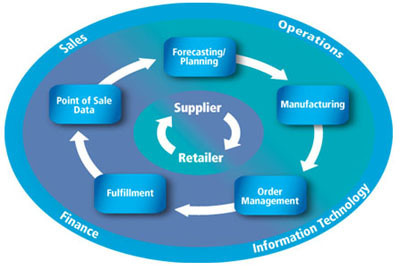 Efficient supply-chain management is essential for meeting customer demands. With an integrated IT infrastructure and a Web-based approach for cross-business communication, your company can operate effectively in an increasingly complex global supply chain. Portals offer greater visibility into product availability and delivery data, while Web-based storefronts simplify selling, improve accuracy, and increase delivery speed. Flexible inventory applications help streamline purchasing, order-processing, and inventory management. These tightly integrated solutions can include the use of bar codes and scanners to maintain accurate, real-time inventory data, thereby further reducing errors. A powerful IT environment helps warehouse management employees optimize layout, picking methods, and movement to secure an efficient product flow throughout the warehouse. You company can then rely on order management software to ensure accurate and on-time order fulfillment. You can also keep up with industry standards, such as advance ship notification (ASN)—with container and item level information sent electronically—incorporated with UCC128 compliance labeling. Access accurate information more quickly. Gain access to up-to-date data by using online inquiries, Web-based reporting, customer self-service tools, sophisticated financial consolidation, and online analytical processing (OLAP) analysis applications. Your salespeople can use this real-time data to help them accurately answer questions on stock availability and pricing. You can also use this timely data to identify buying patterns and then leverage that information to anticipate customer needs and build customer loyalty. 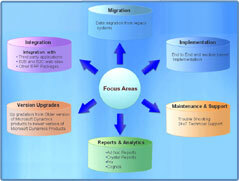 Inteq eCommerce provides a bi-directional fully integrated interface to Microsoft Dynamics for eCommerce transactions. The eCommerce integration to Microsoft Dynamics is implemented through the eConnect interface and the Dynamics GP developer tool kit. These eConnect interfaces allow external applications like web storefronts, web services, point-of-sale systems, or legacy applications to integrate with Microsoft Dynamics . The external applications can perform actions like creating, updating, retrieving, and deleting back office documents and transactions. The architecture diagram below illustrates the integration between Inteq eCommerce and Great Plains. The integration provides an automated integration between Microsoft Great Plains and eCommerce by integrating using a web service layer between the two applications. Automated jobs are setup that can run at different timed intervals.